DocumentsCorePack allows to create documents based on CRM data in MS Word. With the broad variety of features like "Send as PDF" or "Save back to CRM" its a powerfull tool for every day processes like reporting, sending quotes or invoices and much more. To get details to the headlines, please click on the '+' sign. To install DocumentsCorePack in OnPremise/IFD CRM environments a msi-file is provided for download. Running the msi will import the solution into your CRM-system and bring up the configuration wizard. Document generation can be simple triggered from the CRM-Menu. The document will be generated and opened in MS WORD. CRM-records can be loaded into the document directly from within Word. MS Office 2003 / 2007 / 2010 / 2013. Generate complex documents uitilizing all fields from your CRM-system. DocumentsCorePack supports all, standard, custom and system fields to be used inside your documents. No limit on the number of CRM-fields. Use fields from look-ups and One-to-Many relationships. Our Addon supports all relationship-types of MS CRM. Thus you can e.g. use fields from e.g. the potential customer of a quote. From there you can go further and retrieve informationof the primary contact. It is supported to go up to 10 levels deep. Dynamically generate filenames, subject of an activity or save locations. Define in the template a dynamically generated document/filename or define a specific subject name of the activity generated with that document. Insert tables of related records. DocumentsCorePack allows to automatically insert tables for One-to-Many, as well as many-to-many relationships like a list of quote products of a quote. One:Many and Many:Many relationships are supported. Template capabilities (Pictures, QR-codes, password-protection...). - Use dynamic pictures saved in CRM or on a web location in the documents. - Generate and embed QR-codes dynamically based on CRM-data. - Protect generated documents with static passwords or passwords based on CRM -field-values. Once the document is generated, the document can be set up to automatically store it in MS SharePoint. It will be saved to the associated Document Location defined in the Microsoft SharePoint integration for MS CRM or what ever location defined in the template. Save the generated documents to CRM-records automatically. This e.g. enables you to attach the document to an email or to any other entity. ( leads,accounts,..). The FileExplorer integration provided by DocumentsCorePack Client generates a separate folder for each record and gives you so a structured and easy way to add files/shares to your records in CRM. - place the content of the document as email content. - automated mailing by making use of the serverside tools. 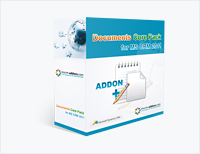 DocumentsCorePack can be used without any restrictions in CRM offline mode. All documents created by a user are saved on the client's temporary and synchronised when the user goes online again. *)creating activities with the generated documents as attachments. If you have questions regarding the licensing, I would recommend to contact us. We are happy to help you finding the best way to license the product. "DCP - Office Open XML Series"